Tidy Bingo is a community site with the player at its heart, offering some super games, a team that is involved in the running of the site and some brilliant games, fun and chat. The site is currently offering a bonus of up to 500 free spins on sign up which is great for new players. Tidy Bingo is such fun and it’s so easy to get involved and win some fantastic cash prizes, but also community games, promotions and specials. From a huge selection of games and features to super friendly chat rooms, a busy Facebook page and a stack of unique promotions and giveaways to boot. When online bingo first came about, it was a fun, community activity with chatty rooms and a community feel, but as the industry has become busier, players have just become one of many. If you miss the old aspect then Tidy Bingo is probably the closest you’ll get as although it’s bustling and busy, it’s all about its community. If you’re looking for the chance to win money, pass the time and gain some new friends along the way then Tidy Bingo is definitely for you! If you want to see some new bingo sites, we recommend that you have a look at the Kozmo Bingo review and also Bringo Bingo review. Tidy Bingo goes above and beyond for new players, there’s the first deposit bonus, spin the wheel bonus, the newbies free bingo for seven days, and the First Timers Freebie where you could win a prize, players will feel like they are getting the red carpet treatment. Tidy Bingo belongs to the 15 Network family of sites, but twice weekly they open their standalone bingo room, the Tidy Cupboard where you can play only against other Tidyers for the prizes, there’s a big charity game once a week too! 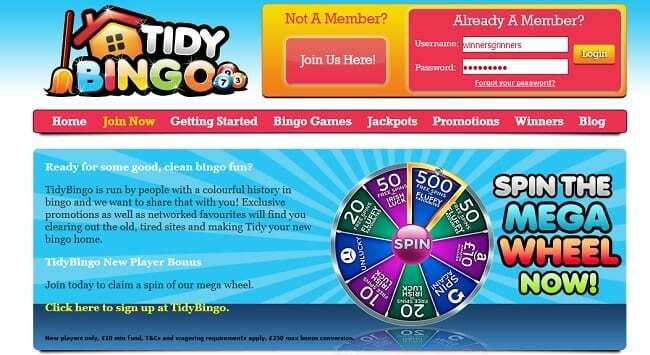 As it happens, Tidy Bingo have nearly double the promotions of other sites within the same family and this is thanks to Tidy exclusive promotions, part of the site’s ethos of putting the players first and being community spirited. Once a week in the Tidy Cupboard you can play for a £50 jackpot in the opening game each week and know that you are helping a great cause in Help for Heroes while you play. Players also get the chance to win a Help For Heroes hoody or t-shirt each time they play too. The owners at Tidy Bingo are so involved, most players know them by name making Tidy one of the most community-spirited sites around! From the interactive Facebook page to the Tidy Cupboard, you’re never lonely when you’re a Tidyer! This brand want your birthday to be that extra bit special and as such, enter you in a draw in your birthday month (providing you have deposited at least £20) to win a tangible prize! Standalone promotions, monthly specials, round the clock jackpots and a great community facing aspect makes Tidy Bingo a lot of fun for players. There’s always something going on, and all you have to do is get involved. As well as desktop access you can play Tidy Bingo from your mobile, and as the mobile play for bingo also includes chat and all the features, you don’t lose that friendly feel either! Due to the layout of the screen, and the full-screen aspect we recommend tablet over smartphone play if you’re logging on on the move.